In a quiet part of the popular resort Novi Vinodolski you will find this very good and stylishly furnished holiday home for 4-6 persons. The beautiful 95 square meters apartment for 4 to 6 persons consists of 2 bedrooms, 2 bathrooms, a separate living room, dining area and kitchen. In the living room there is a sofa bed for 2 persons. Furthermore, the apartment is equipped with 2 air conditioning, irons, satellite TV and Internet. Behind the house there is a large private car park. 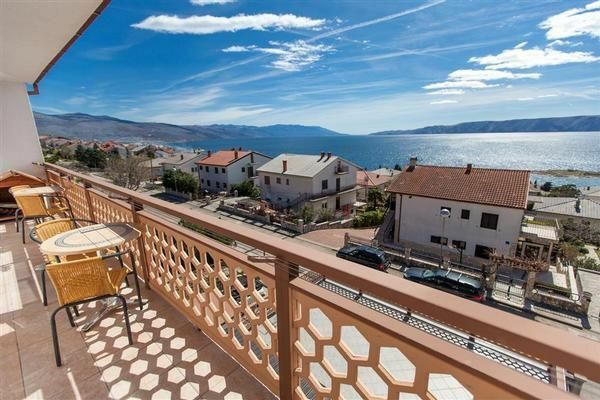 As a welcome gift for the guests of this holiday apartments, the homeowner owns a restaurant at the sand beach in Crikvenica offers a free meal on the day of arrival. Living area: separate living room, dining room and kitchen are in one room, sofa bed for two people, with balcony, with sea view, laminate, ceramic tile, satellite TV. Kitchen Description: Kitchen, dishes available, kitchen towels, electric cooker, hotplates: 4, oven, refrigerator with freezer, coffee machine, kettle, microwave, toaster, dishwasher. Balcony / Terrace: private balcony, covered, with sea views, seating available, Balcony Size: 10 sqm. For the Dogs is an extra house available in which the dog can pull back. The apartment is equipped with 2 air conditioners and central heating. Distances: from the sea 390 m, fine gravel beach 490 m, pebble beach 490 m, rocky beach 390 m, concrete beach 500 m, center 700 m, restaurant 750 m, supermarket 700 m, diving center 1000 m, Disco 940 m busy road 290 m.
Booking fee: once per object Costs amounting to 19 EUR (Mandatory).